Lots of posts here today but I've have lots of things to tell. 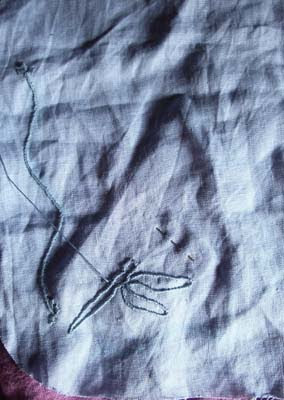 The stem on the wine and the outline of the dragon fly is made with stem stitch, and the leaves are made with satin stitch. I'm not very happy with how the leaves look, so I think I will try to make them with buillon knots instead. I work on this when I travel because I always get bored I don't have anything to do and have to sit still for hours. I think it will be lovely! Did you see the black dragonfly at Linnés garden? "Oh, honey, does my hips look big in these?"